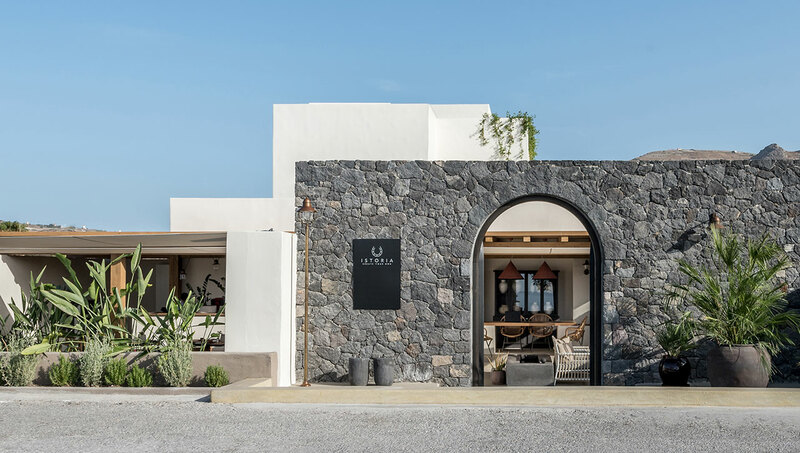 Photo by Giorgos Sfakianakis © ISTORIA Hotel, Perivolos, Santorini, Greece. 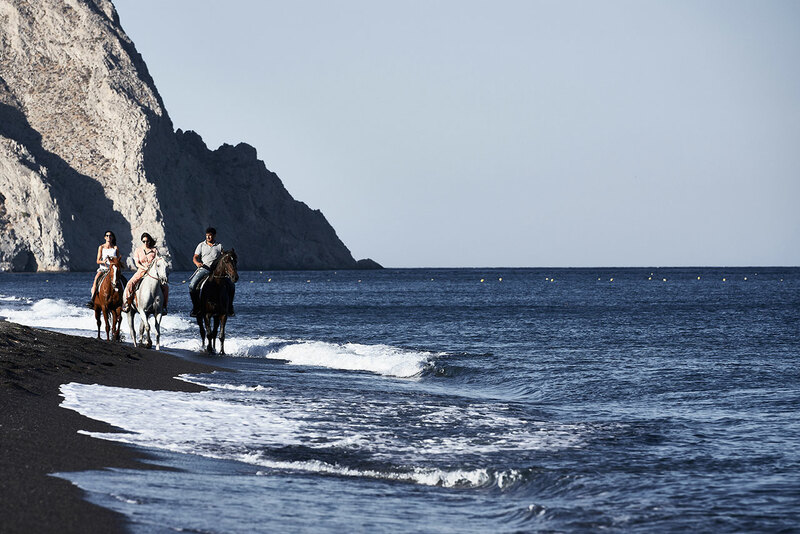 Santorini is a world renowned destination of compelling beauty courtesy of the island’s partially submerged caldera. 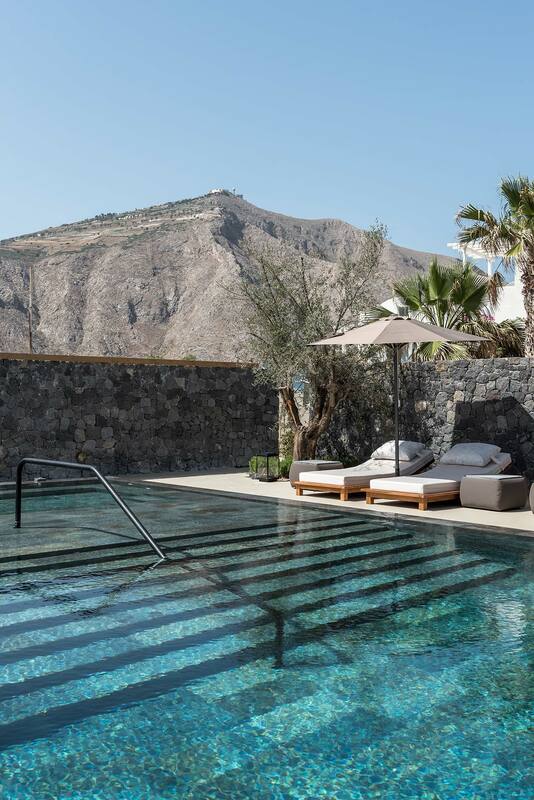 Although it makes for spectacular views of the mythic volcano, this unique geological setting also means that most touristic developments are concentrated on this part of the island, perched atop the caldera’s rim. 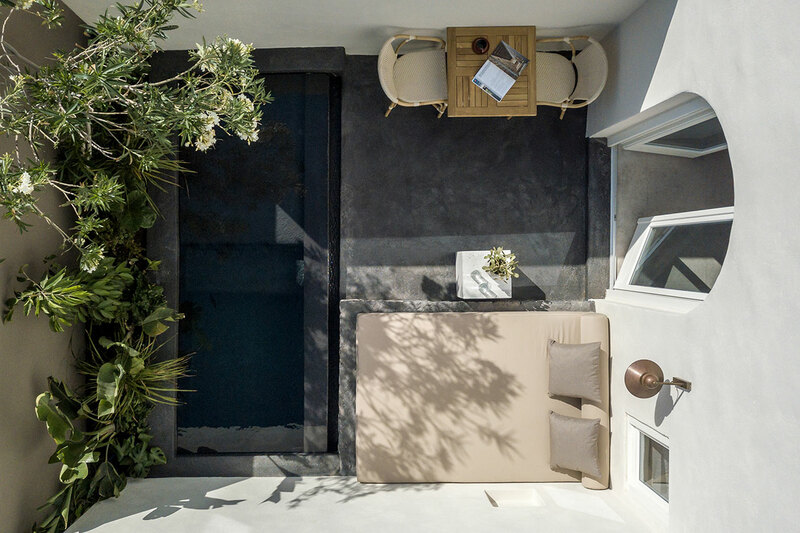 Located on the other side of Santorini, the new ISTORIA boutique hotel offers an alternative narrative that swaps the chattering crowds flooding the terraces, balconies and rooftops of Fira and Oia for the serene ambience of Perivolos Beach where the black volcanic sand dips into the midnight blue waters of the Aegean, “istoria” after all means story in Greek. 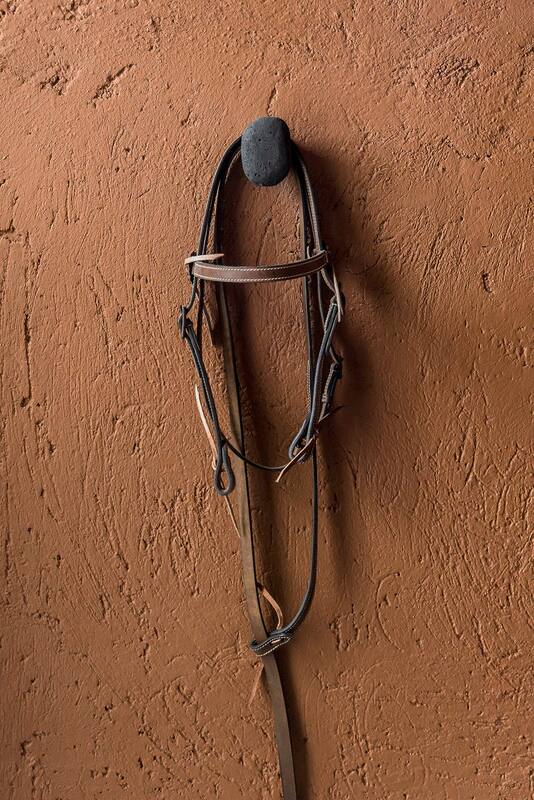 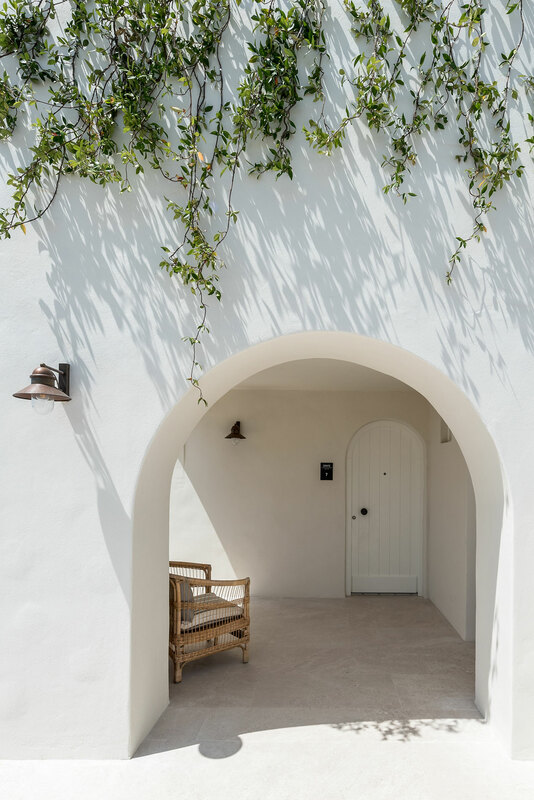 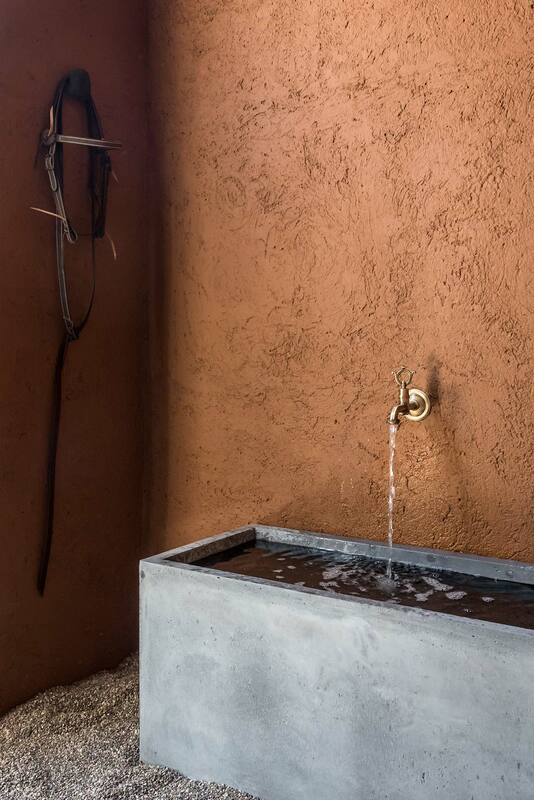 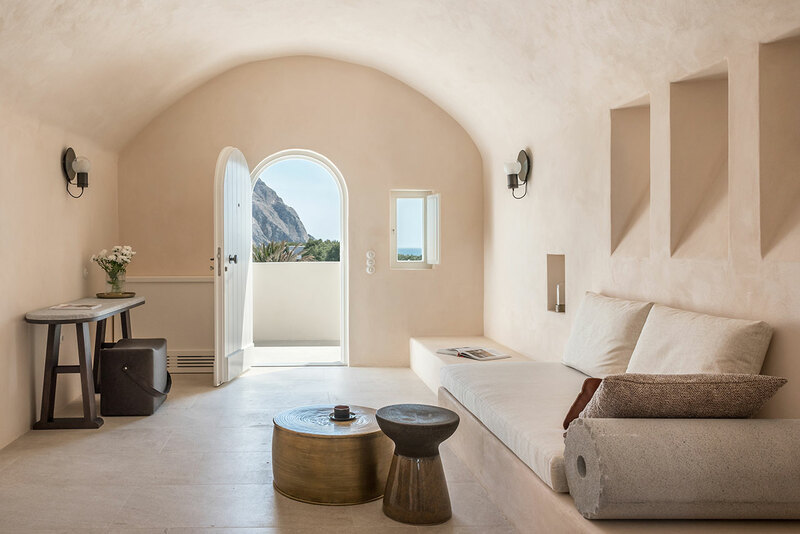 Designed by Athens-based Interior Design Laboratorium, the 12-suite retreat has taken over an abandoned residence next to the beach, including five stables that used to house the previous owner’s beloved horses. 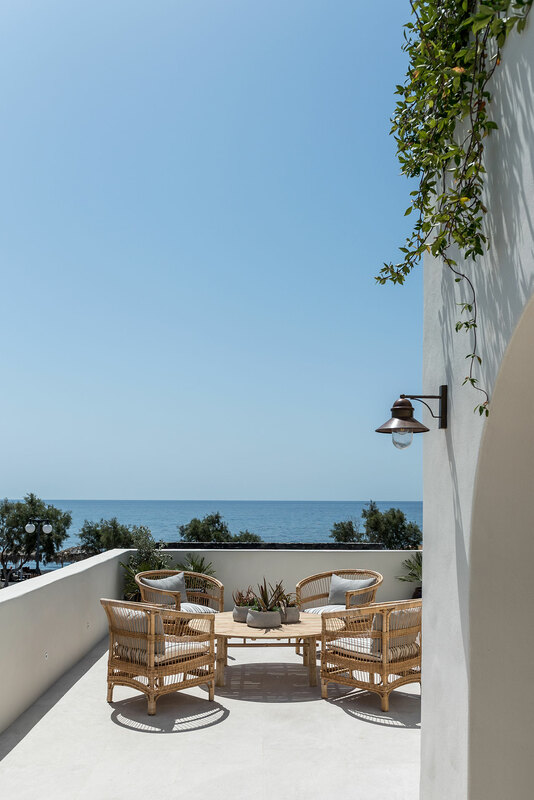 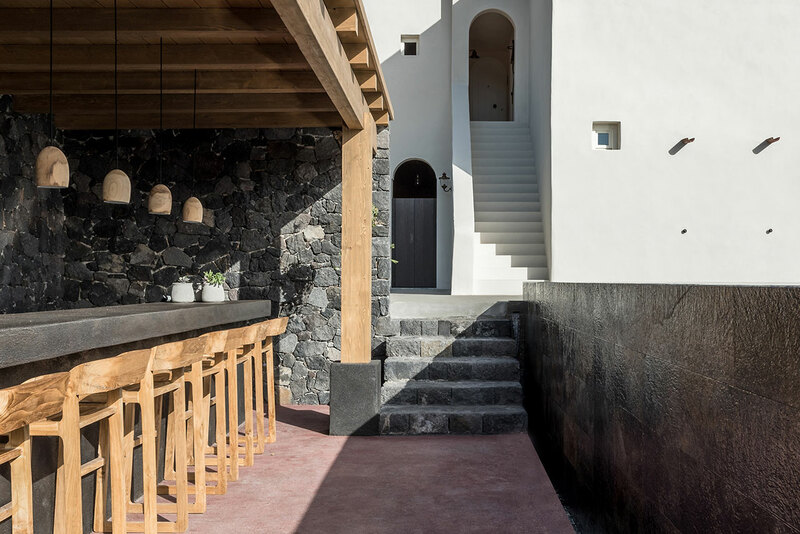 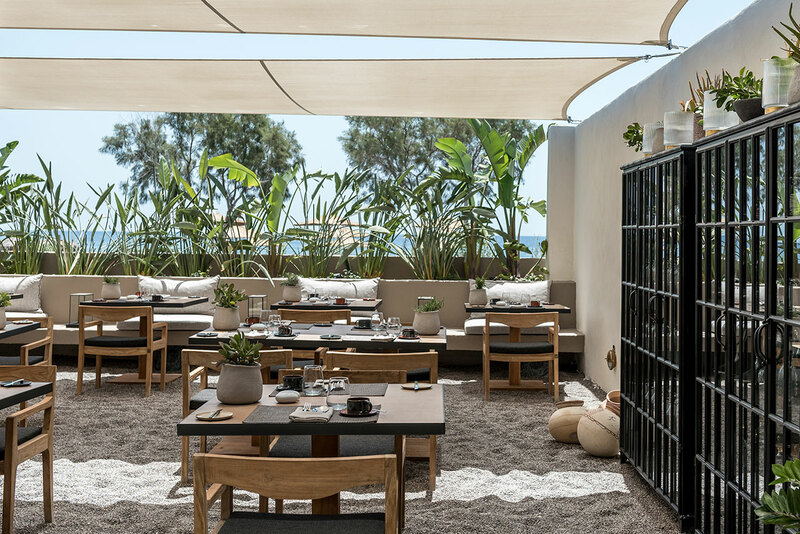 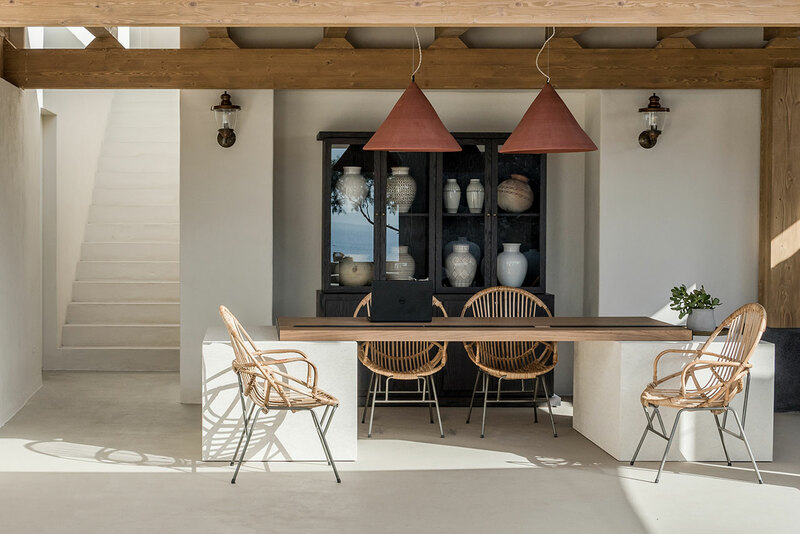 The building's story underpins the hotel’s primary character as a refuge: a home away from home that welcomes guests in a setting of pure Mediterranean bliss filtered through a contemporary aesthetic of stripped-down luxury, where guests can create their own narratives fuelled by the sun and sea. 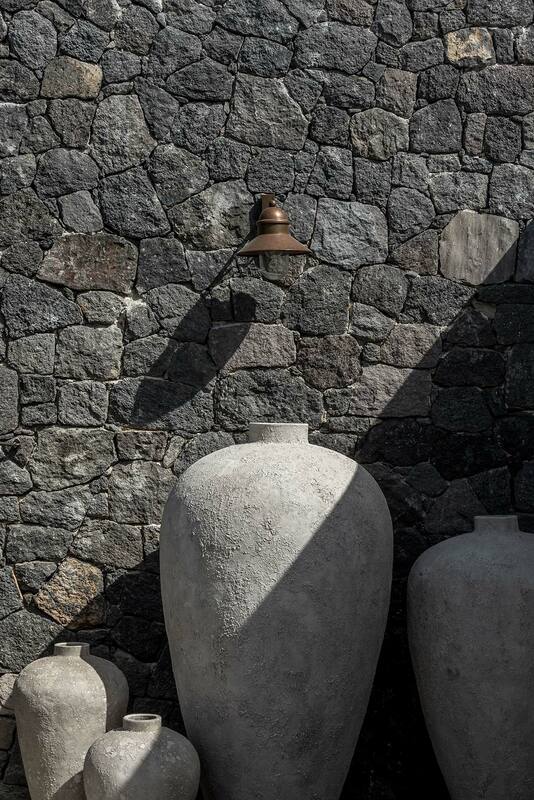 Photo by BREBA2 (Claus Brechenmacher and Reiner Baumann) © ISTORIA Hotel, Perivolos, Santorini, Greece. 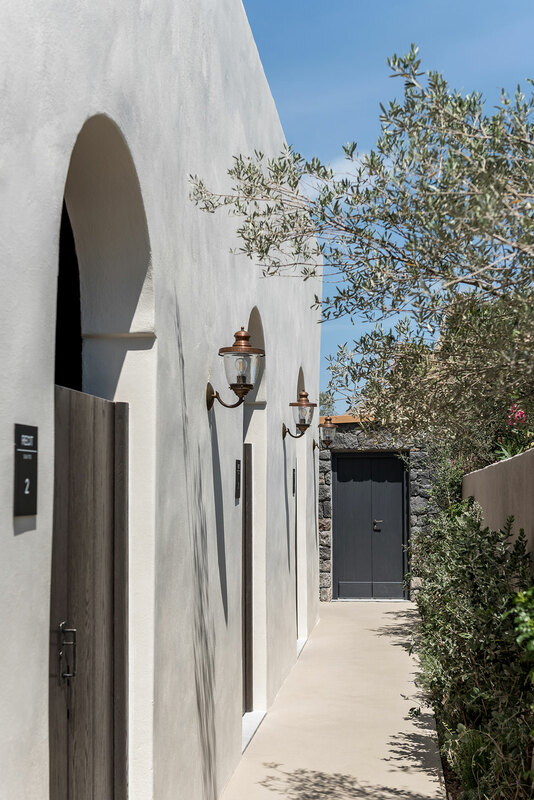 Great care was taken by the architects to ensure that the building was renovated in terms of both functionality and elegance while ensuring comfort and privacy. 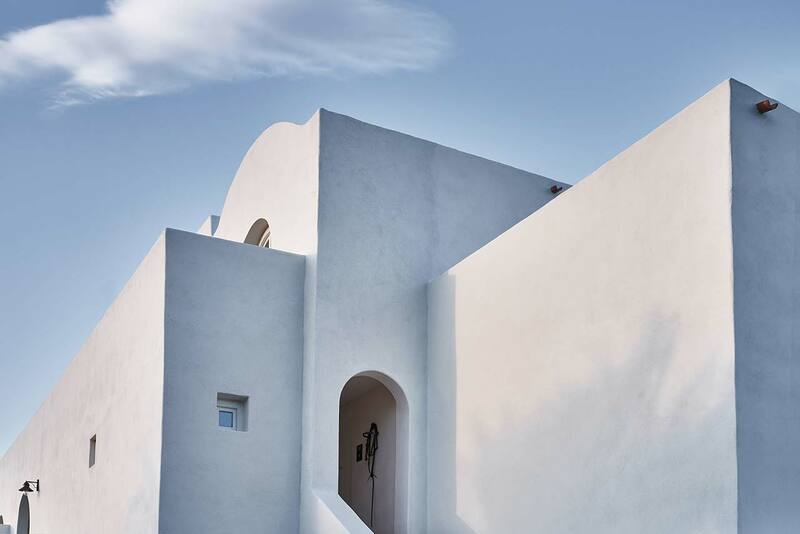 Eschewing the all-white Cycladic aesthetic that most new developments espouse, the architects have introduced a selection of materials that combine the island’s traditional building techniques with elements found around the Mediterranean. 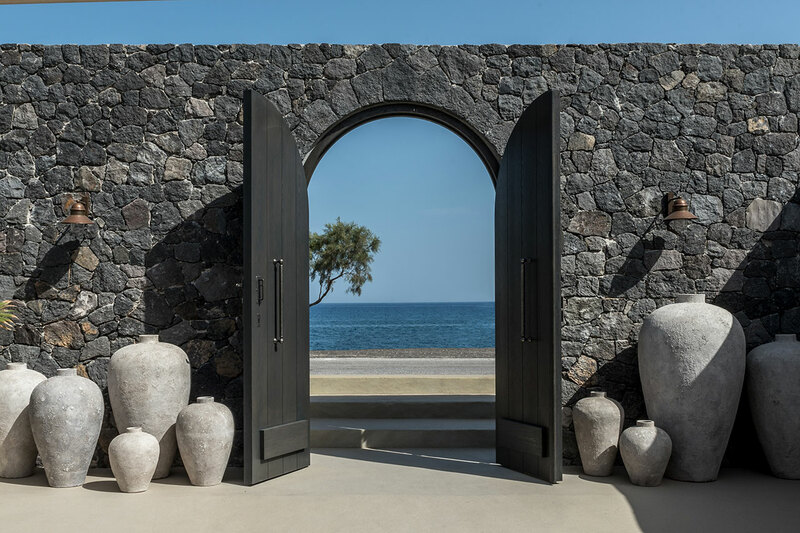 Uniting this eclectic palette is a shared affinity for earthy textures and colours: black volcanic stones, unwrought rocks, coloured plaster and dark sand from the adjoining beach are harmoniously intertwined with polished screed floors, smooth stone tiling and terrazzo steps, while wooden furniture and handcrafted textiles enrich the tactile nature of the spaces. 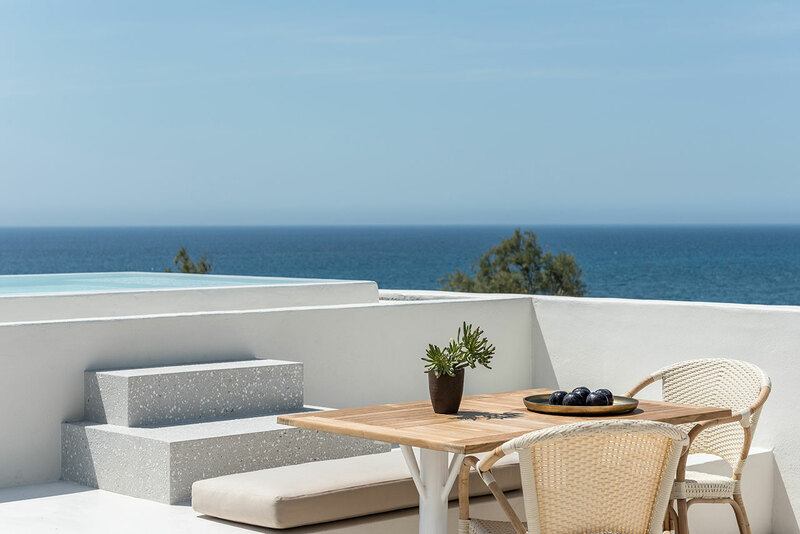 This medley of textures is evocatively reflected in the equally diverse selection of Mediterranean flora such as century old olive trees, fan palms, herbs and aloe vera, which gracefully envelope the outdoors areas in verdant gracefulness. 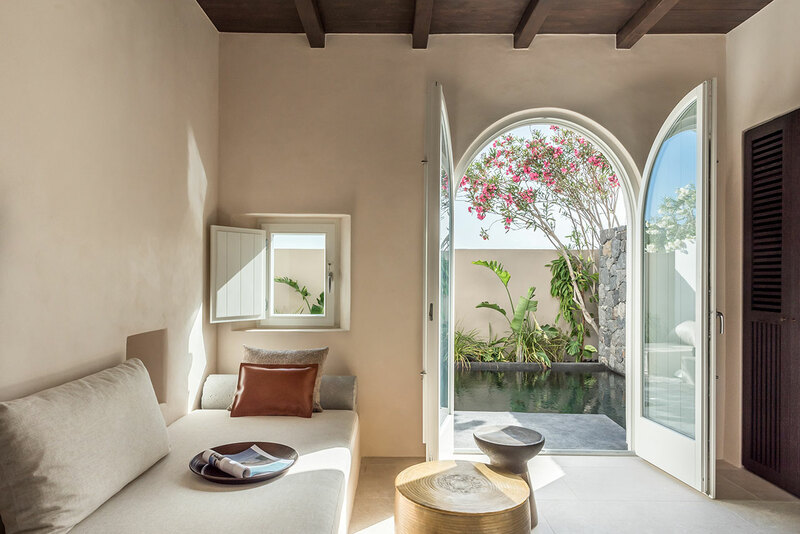 Architecturally, the design adheres to the local vernacular exemplified by thick structural walls, vaulted rooms, and arched doorways. 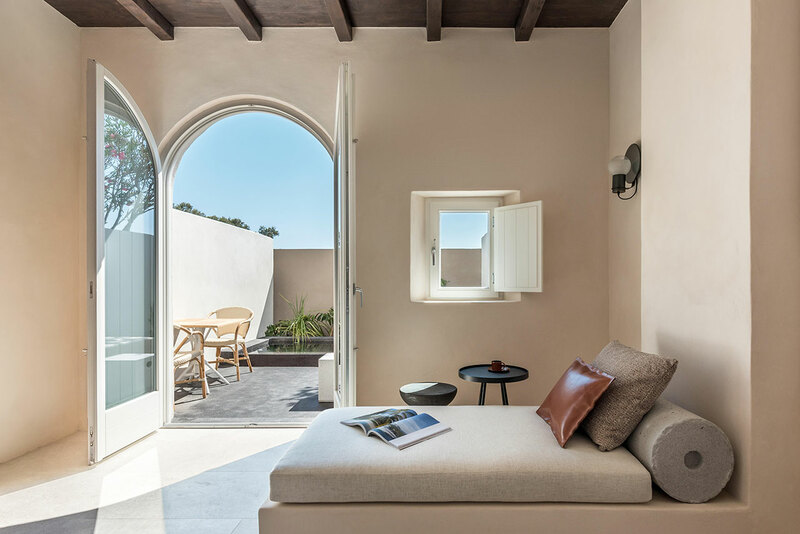 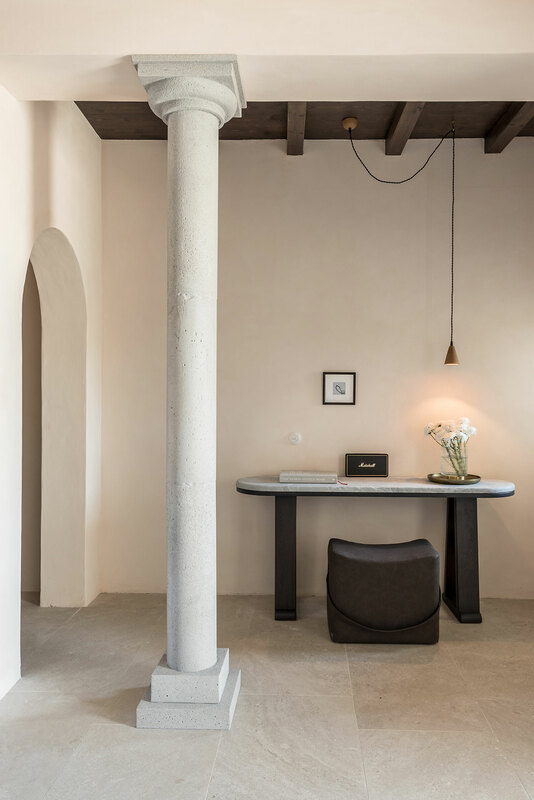 The interior design also incorporates several elements of the existing building, such as timber ceilings and stone pillars, the latter found in the property’s gardens and incorporated into the suites’ interiors. 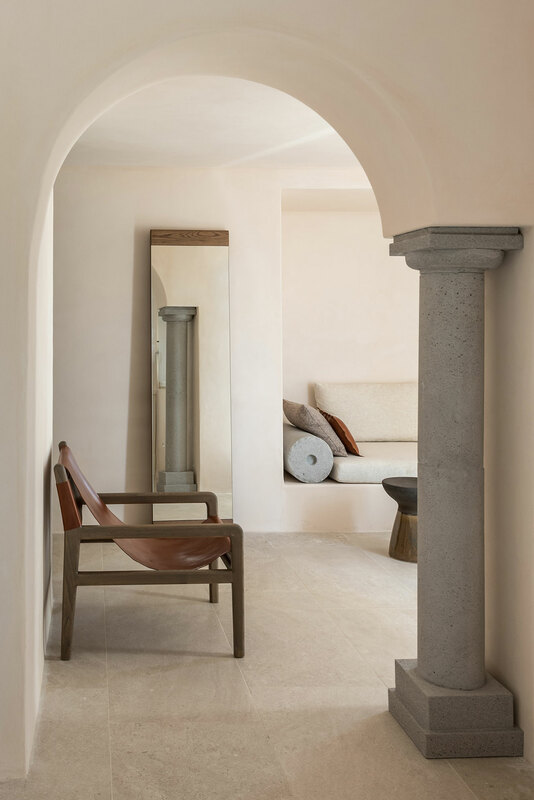 The understated decor is rounded by a subdued palette of beige plaster walls, earthy fabrics and deep blue details, inspired by the murals found in the Minoan-era settlement of Akrotiri, and a sparse selection of contemporary furniture of understated sophistication that were specially designed by the architects for the project. 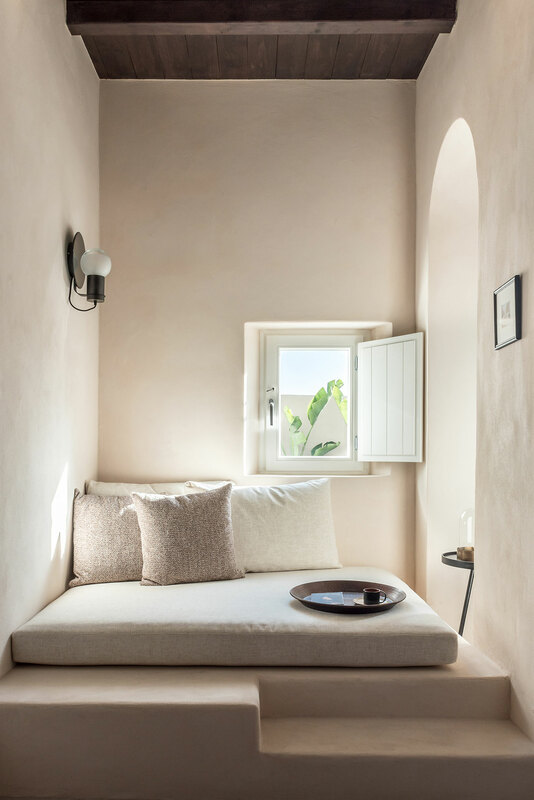 The 12 suites are individually designed as a sequence of smaller and larger rooms with a meticulously choreographed composition of smaller and larger openings that make guests feel that they have stepped into a friend’s house rather than a hotel. 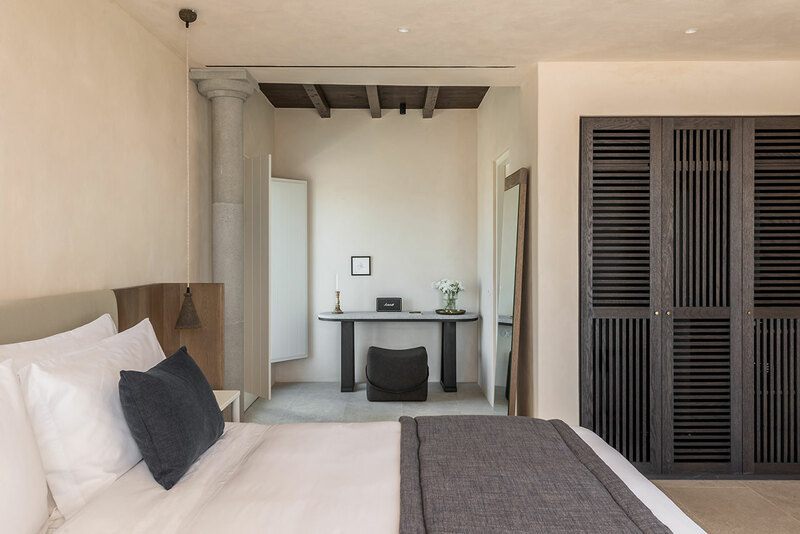 The guest rooms are complemented by a series of private terraces offering sweeping views of the beach and secluded patios allowing guests to withdraw for reflection, while also accommodating private pools or Jacuzzis. 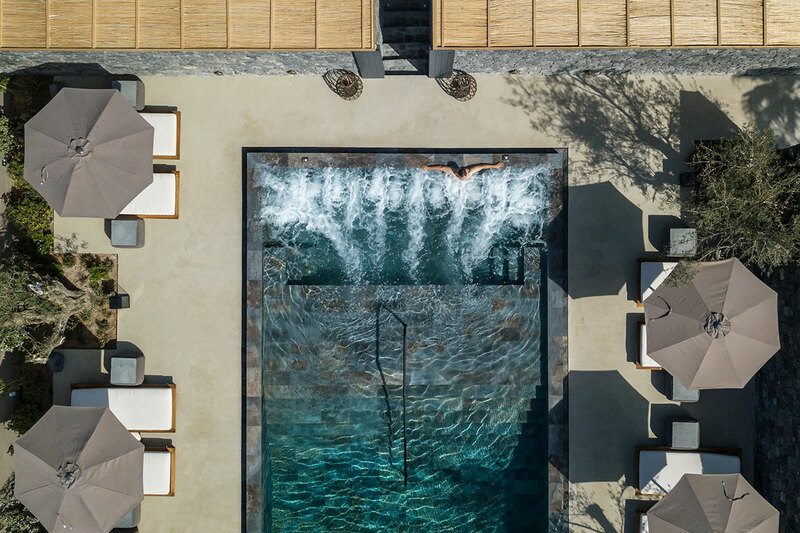 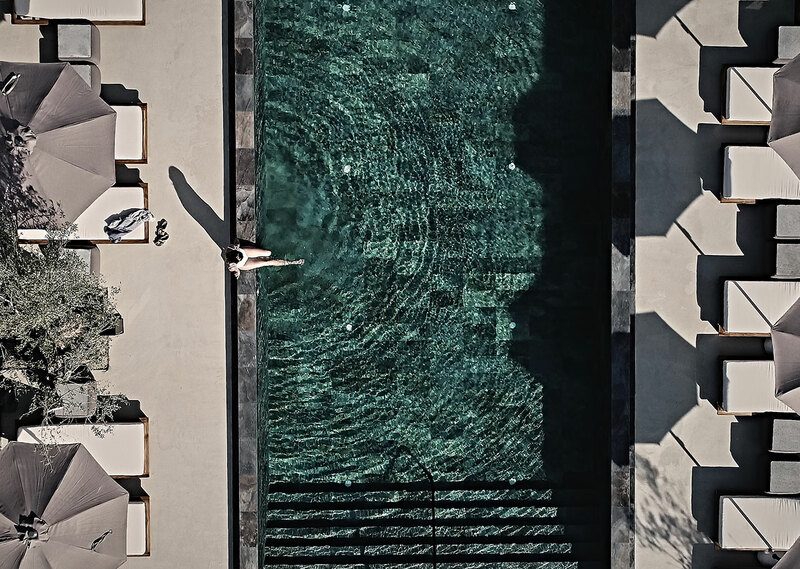 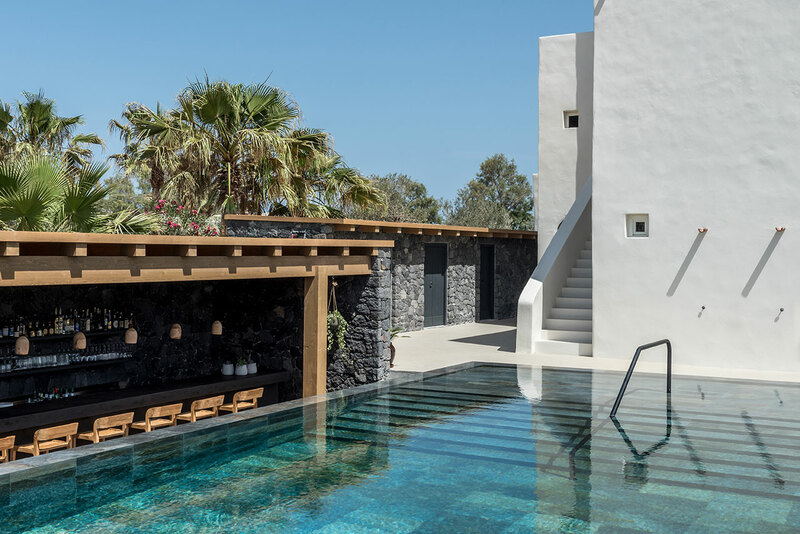 Alternatively, guests can enjoy the hotel’s main pool which is lined with dark stone slabs, in what is a soulful allusion to the black volcanic beaches of Santorini. 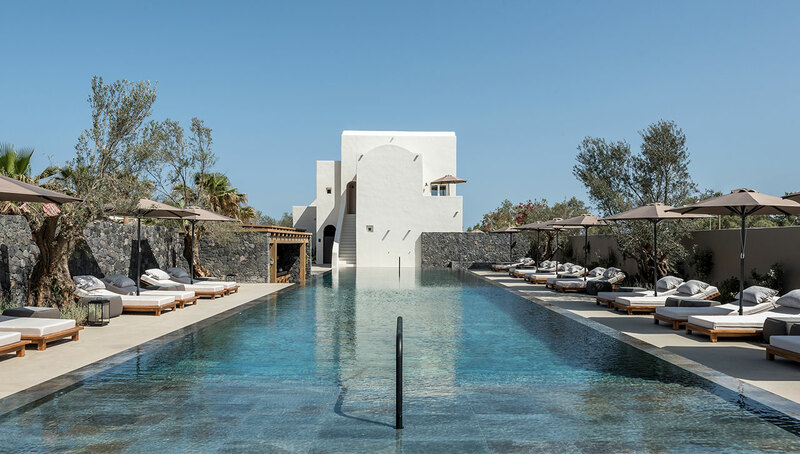 The hotel’s amenities are completed by a restaurant helmed by the celebrated chef Alexandros Tsiotinis, whose modern Mediterranean menu is underpinned by the locally sourced vegetables and herbs from the hotel’s organic garden, and a spa offering refreshing treatments based on organic and regionally derived ingredients. 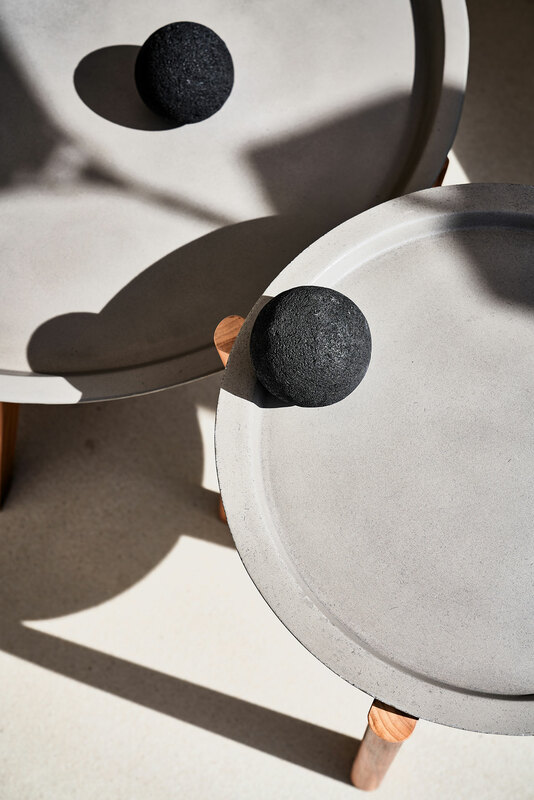 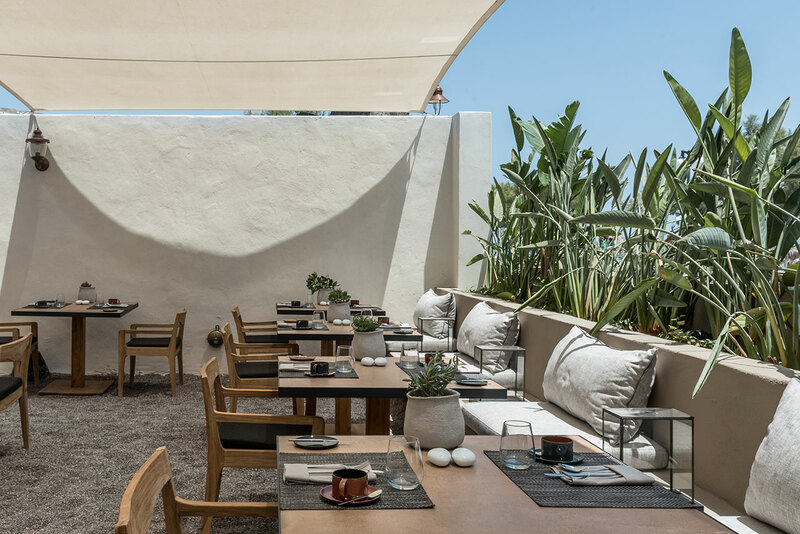 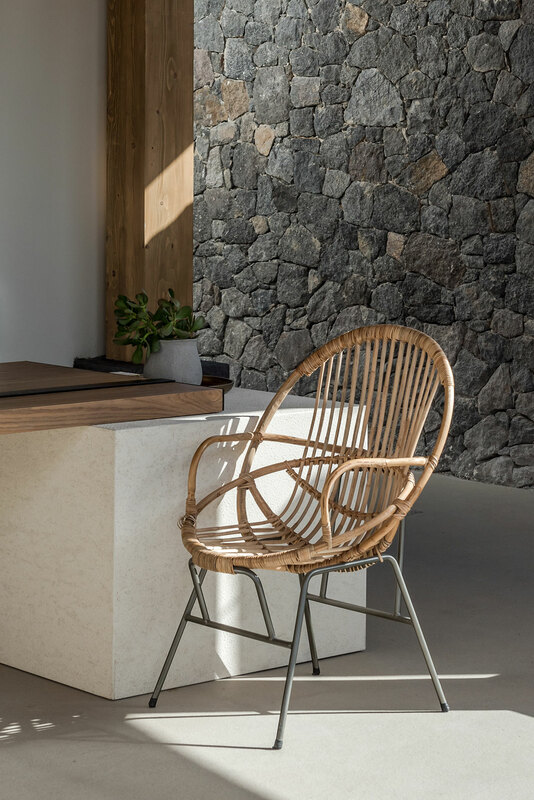 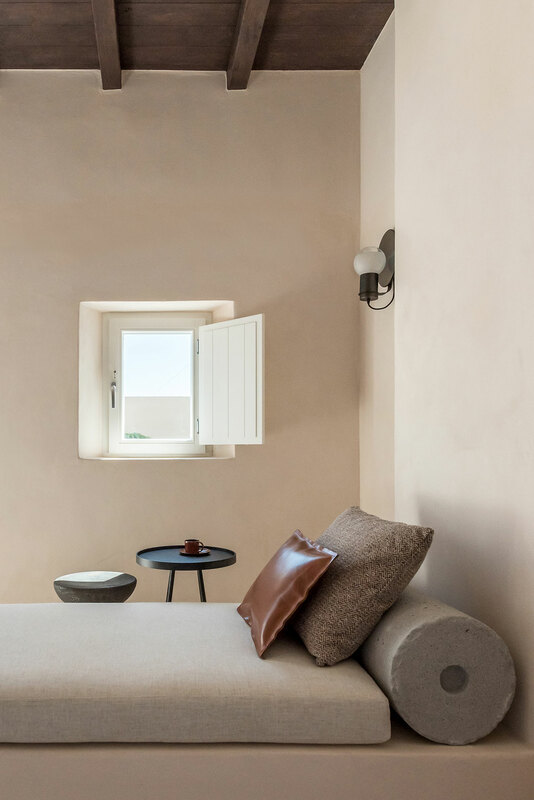 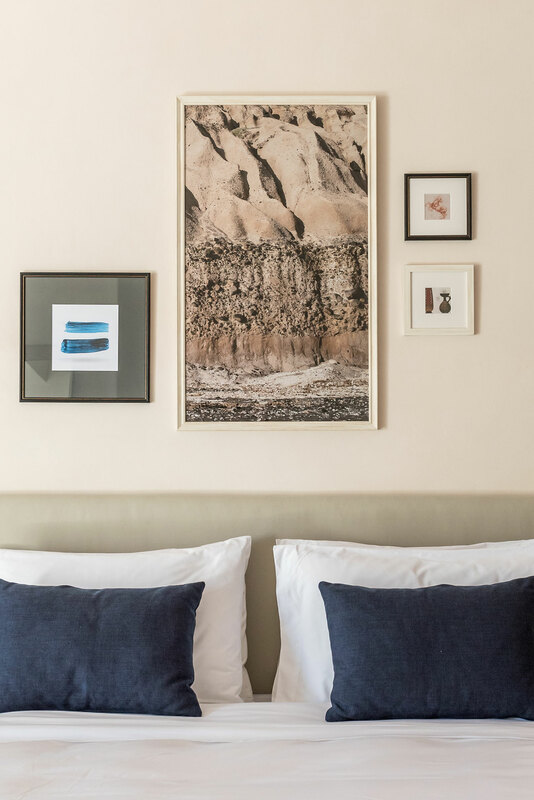 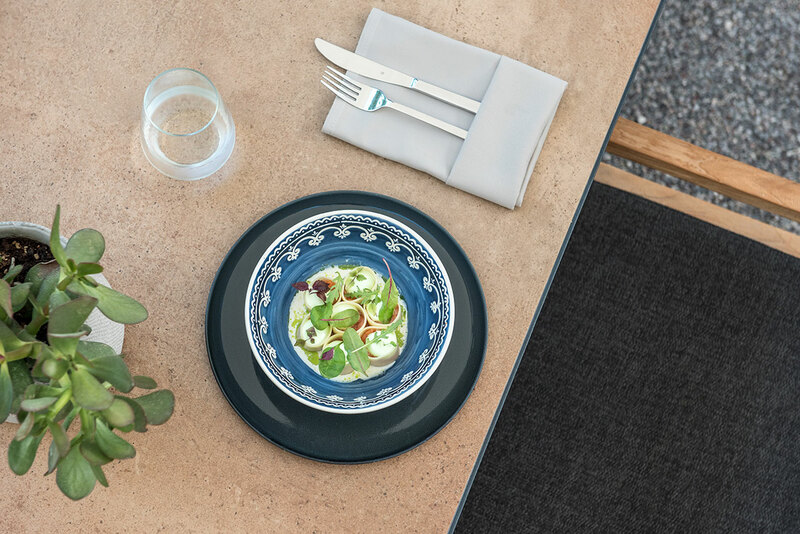 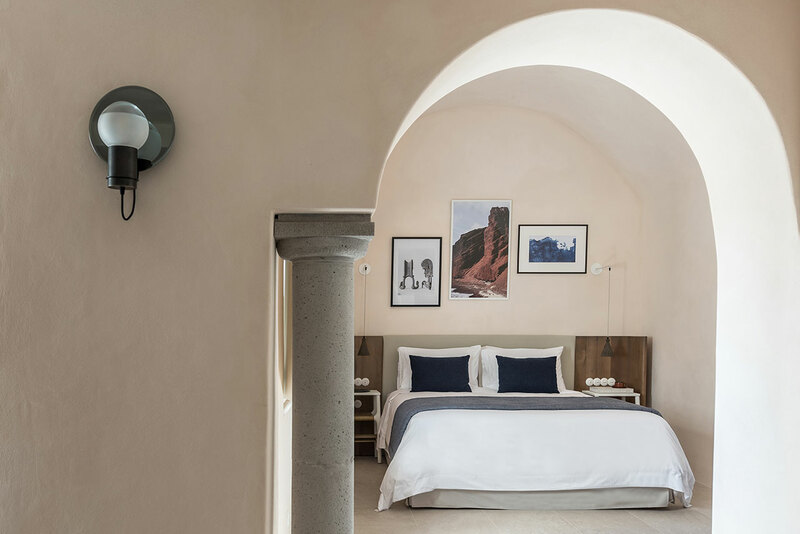 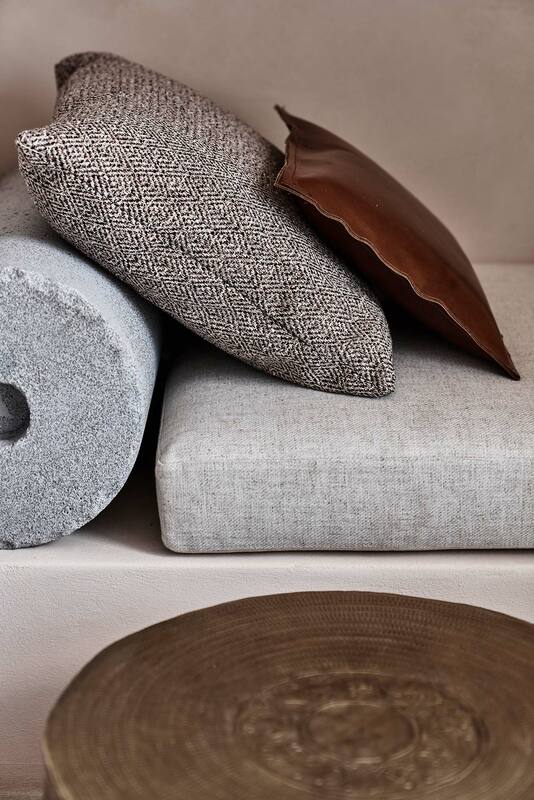 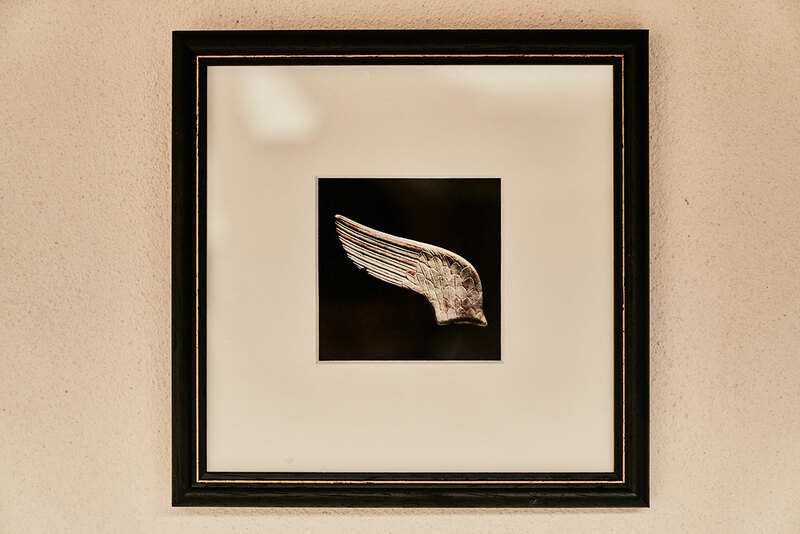 Like the rest of the hotel, both are designed in the same stripped down, Cycladic aesthetic of rough elegance and muted luxuriance, which imbues ISTORIA with a sense of timelessness and authenticity and gives the impression that it has always stood here.